I know.. you wanted to hear 2 days or maybe even one day, right? 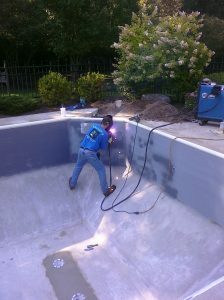 One day might be possible… if I were replacing a liner on a pool that is one year old. The Real Truth… It Depends. The majority of pools I come across are older and have had two or three liners replaced over the years. The liners are extremely faded and might have a few leaks. 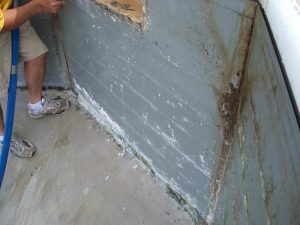 This pool had major oxidation on the aluminum walls. The skimmer panel had it the worst. There was no way we could just cover this up with a new liner without first fixing the problems underneath. Some of the wall panels had holes through to the backfill behind the panels. The oxidation & calcium build up had to be removed. Every hole had to be patched, sanded & primed with a special galvanizing primer. When that was complete we were able to move on to the skimmer replacement and wall repair. 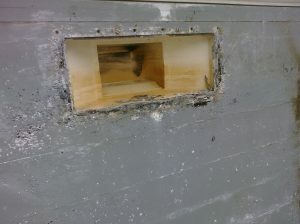 The skimmer panel was cut out and a new panel welded in its place. In order to do this we had to cut the concrete deck and replace the skimmer completely. Special thanks to A to Z Sheet Metal in Lafayette, IN for coming out to weld our new skimmer panel. When choosing a pool dealer to tackle a pool renovation such as this, try to find someone you can trust to not overlook these big issues. And remember, a liner replacement is never just a liner replacement. Count on being there on site when the liner is removed to see for yourself what is underneath that old liner. You can then ask your pool dealer. What can be done to clean up and fix the mess underneath. Sadly I know pool dealers that would have installed the new liner and been on their way. Comment below if you’ve had a horror story with your pool. We would love to hear how it went. 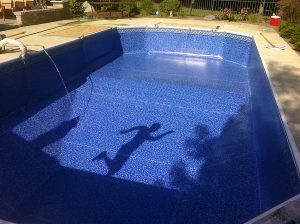 I work for Leisure Time Pools in Oklahoma City, OK. We recently did a liner in a pool that looked exactly like this one. We are trying to figure out who manufactured this pool. Would you happen to know? Any help would be appreciated. I appreciate you being honest about how long it takes to replace the pool liner. If there is anything I know about doing any maintenance or remodel work, it is that it takes longer than expected to complete the job. Sometimes it is quick and easy, but that is the exception and not the rule. Thanks for your comment. You’re right.. I would love more quick and easy jobs but that never seems to happen.